How much fun are these cosmic brownies? They are a homemade version of the boxed variety you buy at the store. 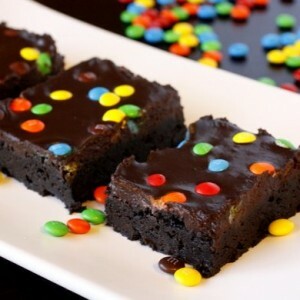 You know…the ones covered in M&M’s that you can’t help but eat, even though you know they’re not as good as homemade? Pre-heat oven to 350. Grease a 13x9 pan and set aside. Whisk together the sugar, brown sugar, melted butter and water in a large bowl. Add the eggs, vanilla and espresso powder and stir together. In a medium bowl, mix together the flour, cocoa, baking powder and salt. Stir the dry mix into the wet mixture and stir to combine. Spread the batter into the prepared pan. Bake for 18 minutes or until the brownies are just done and a toothpick inserted in the center comes out with moist crumbs. Set on a rack to cool. While the brownies are baking, prepare the ganache. Chop the chocolate into small pieces and place in a mediume sized bowl. Set aside. In a small saucepan, heat the cream just to a simmer. Don't let it come to a boil. Remove from the heat and pour over the chocolate. Sprinkle with the salt and let sit for a few minutes. Stir gently until the chocolate is melted and the mixture is smooth. Set aside to cool slightly. When the brownies are mostly cool, pour the ganache over the top and spread evenly. Sprinkle the mini M&M's over the top, as many as you like. Cool in the fridge until the ganache is set.